Public School designers Dao-Yi Chow and Maxwell Osborne with the model wearing a winning get-up (center). Photos courtesy of The Woolmark Company. THE gray&black hoodie and baggie short get-up in leather and wool is a high concept piece from the design team, Public School. 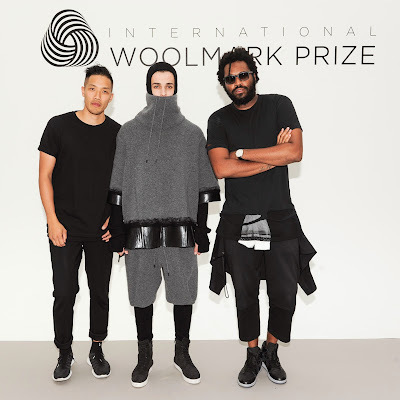 It also won the 2014 International Woolmark Prize Regional USA award for best menswear in the first year that The Woolmark Company, for which the IWP is named, is introducing an award for menswear. The judges, including Alexander Wang, apparently bought the story, and Public School walked away with a glass plaque, plus $47,000 USD. 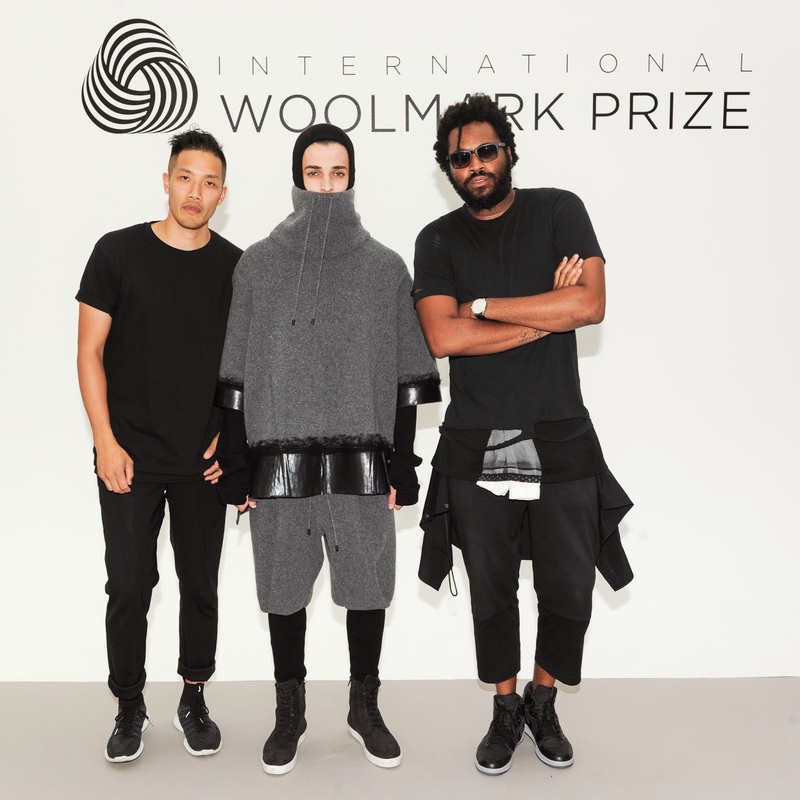 A regional win also advances the label to compete in the menswear finals in January 2015 in London against the winners from the other four regional finals – Asia, Australia, Europe and India/Middle East. Success in the finals will net Public School or the eventual winner nearly $100,000 and placement in select high-end retail stores around the world, including Saks Fifth Avenue and David Jones. 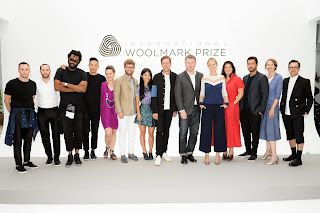 The 2014 International Woolmark Prize Regional USA award nominees. Australia-based The Woolmark Company is an authority on wool and merino wool. 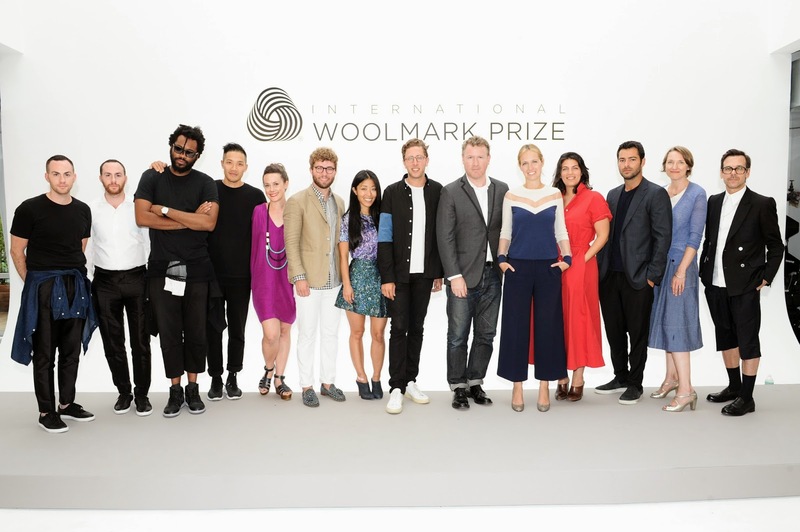 It has presented the IWP to emerging designers to help them develop and sale their collections for 61 years, retooling it in 2012. Past alums include two giants in the rag trade, Karl Lagerfeld and Yves Saint Laurent. The IWP USA regional winner for womenswear was M. Patmos, designed by Marcia Patmos. She produced an understated, slightly deconstructed coat, top and abbreviated bell-bottomed pants ensemble in gray&white. She will compete in March 2015 in the womenswear finals in Beijing. Meanwhile USA menswear winner, Public School, is a label that is made in New York and created by a duo that was also made in New York. Founded in 2008, Public School sources from references high and low, far and wide to create relaxed, laidback, effortless affairs in a color palette that is mainly black&white&gray. In February, during Mercdes-Benz New York Fashion Week, the label introduced womenswear to good notices. Marcia Patmos (left) with the model wearing her IWP-winning womenswear outfit. The minds behind the magic are content to bask in the glow of this latest success, not thinking overmuch about January. But what will Public School do with the nearly $50 grand? They're not going to Disney World. “It goes right back into the infrastructure,” baritoned Maxwell Osborne, the other half of the design team.